Left to right: Gerald Morgan (HeartSine’s Network and Systems Engineer) , Jason Copeland (Team Coach), and Mark Delaney (Facilities Manager). 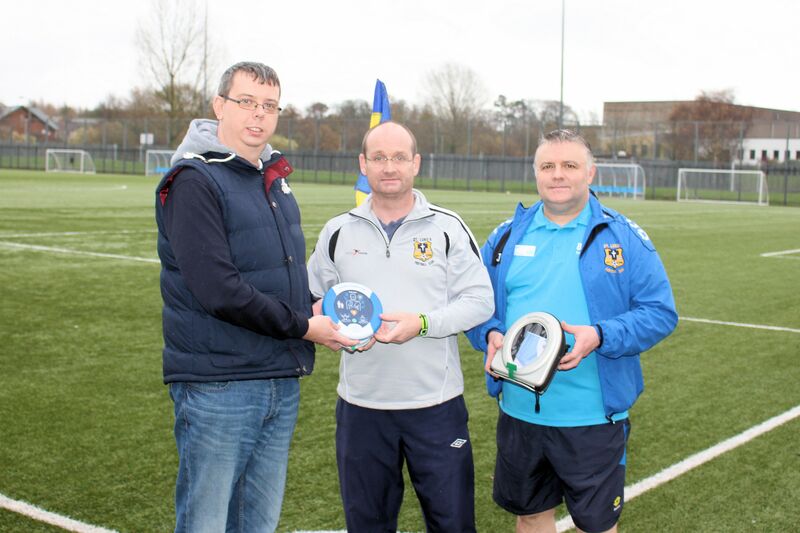 Gerald Morgan, Network and Systems Engineer at HeartSine Technologies, has donated a lifesaving HeartSine samaritan® PAD Automated External Defibrillator (AED) to St Luke’s Football Club in Belfast, Northern Ireland that will protect the team’s players, spectators, and thousands in the local community in the event of a Sudden Cardiac Arrest (SCA). Morgan received the AED as a holiday gift from HeartSine Technologies and chose to donate it to St Luke’s Football club because has friends and family who have played for the club and because he wants to ensure that his hometown community is heart safe. Based in the Twinbrook area of Belfast, St Luke’s Football Club caters to players 16 years of age and older. As the club’s home pitch is based at the Brook Activity Centre, a recreational centre used by the community of Twinbrook, patrons will have access the AED in the event of an SCA. Sudden Cardiac Arrest (SCA) is a malfunction of the heart’s electrical system, which causes it suddenly and unexpectedly to begin to beat rapidly, then erratically, and finally to stop altogether. It can happen to anyone, anywhere and at any time. SCA can strike regardless of age, race or gender, affecting all ages from infants to seniors. With 84% of SCA events occurring away from a healthcare setting, including during sporting events, it is imperative to house AEDs in all sporting fields and public places. Click here to learn more about the HeartSine samaritan PAD.